Andy was a great man. He loved Jesus and dedicated his life to serving Him. 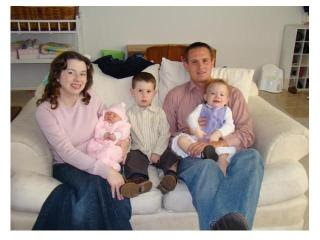 He loved his family and laid down his life for his wife and three children. They had hoped to one day move to Thailand to serve as missionaries. To this end Andy was studying Buddhism, and had become quite the expert, so I’ve heard. He had character, integrity, and humility. He was not the kind of man the world could afford to lose. I’ve known him since the third grade. He has always been a good friend of mine, even when our lives took us in different directions. After graduation in 1996, he went to college in Georgia, and I went to Ohio State. That was where he met Susanna, and I still remember him telling us about her, convinced that he was going to marry her. Of course, he did. Our lives intertwined in an odd sort of way after college. He went off to Gordon Conwell Theological Seminary, earning his M. Div in 2004 (or possibly 2003). I went back to Toledo to lead a college ministry at Grace Church. After two years I went off to Gordon Conwell, and he came back to Grace to lead that same ministry. Andy paid me one of the highest compliments. He said, “Dude, I wish I were going to be living in the States, because I would definitely be a part of your church.” When someone with that level of character says that to a young, would-be church-planter…well, it means something. It meant a lot to me. He eventually set aside his dream to be a missionary in Thailand and joined the police force in Ft. Myers, FL. After about a year of service, he was shot and killed in the line of duty. I know that Andy is with Jesus now, and he’s probably chatting up Moses, or something awesome like that. And I know that he and his wife will see each other again. I pray that his three children will all turn to Jesus when they reach the age of accountability, and that all that is so wrong right now will be made right again.